SIGN TO BRING BACK “THE DEBATERS REALITY SHOW”! ‘Hello Everyone, we know you cannot wait for the next season, thank you for your messages and support. Please stay tuned to this page as something really exciting is coming your way soon. Oratory … the power to change [Posted on Facebook on the 5th of July, 2011]’. And that was the last we heard of The Debaters, a reality TV show which once kept thousands upon thousands of Nigerians glued to their Television sets while its two seasons lasted. This captivating and educative programme was a first of its kind as it gathered some of the country’s best youthful brains, trained them in the almost-lost-art of polemics and enlightened a broad audience sitting in the confines of their home while so-doing. It was a unique programme which rewarded intellectual growth and showed the world that Nigerians aren’t just fantastic on the football pitch or in amphitheatres. Sadly and to everyone’s dismay, after the completion of the second season, the third never came. For four long years, we’ve waited but it still is not here. That lovely programme vanished into thin air without a word of explanation. But of course, it can easily be assumed that someone got tired of sponsoring it perhaps because it brought no financial gains. However, this gloomy disappearance and intellectual homicide ensued in the same era where Big Brother Africa has been held for nine years consecutively and with the winner getting a whopping sum of US$300,000 last year. This tragedy is occurring in the same era Nigerian Idol, another Reality show, has been held for five years running. It is happening in the same time where MTN Project Fame has been annually held 7 times in the past and 18 contestants are presently battling it out in the 8th edition. We also have the Glo Naija Sings, Guilder Ultimate Search, Maltina Dance All amongst many others. The importance of these entertainment shows is not in any way being undermined. But then the non-existence (and premature death) of equally top-class intellectually flavoured programmes (such as ‘The Debaters’ and Zain Africa’s Challenge) depicts the lopsided nature of our priorities. In the year 2009 when ‘The Debaters’ made its debut, Lola Odedina (Group Head, Communications and External Affairs, GTB) said that GTB’s support for the programme was predicated on the fact that the development of the mind and the intellect is a tool for sustainable development. She also added that if the country would reproduce the like of Anthony Enahoro and Wole Soyinka who had through their oratorical skills been agents of positive change at one time or the other, there is the need for a well-structured system that would breed such agents. To conclude therefore, I am humbly using this medium to call on Nigeria’s rank and file to strongly demand for the resuscitation of ‘The Debaters Reality Show’ and other programmes like it. Similarly, the bigwigs and large corporations in our society should also support intellectual activities as much as they do for recreational ones. 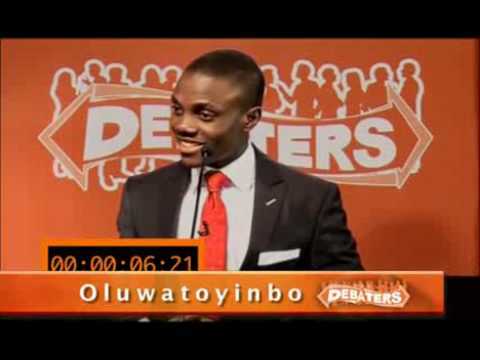 Particularly, the National Orientation Agency, the Ministries of Education and Youth Development and finally, Inspire Africa (which initiated it ab intio), should all strive to revive ‘The Debaters’ soon and in earnest. It will cost virtually nothing, yet the intellectual drive that we stand to benefit is simply enormous. Bring Back The Debaters! Bring it back. Make it bigger and better. This movement is not just about THE DEBATERS , it is to correct the general insouciant attitude of government and society to intellectual activities.